I remember my very first Scalextric as a child. Yes, it’s been going that long, longer, in fact, it’s actually been going for over 60 years. Isn’t they incredible for a toy? My Dad and I played for hours racing those cars around. It was a blue and orange one. Toys like this are lovely, to be able to share those childhood memories with your own kids. For as much as the toy has kept going and is fundamentally the same, it’s changed and changed for the better. 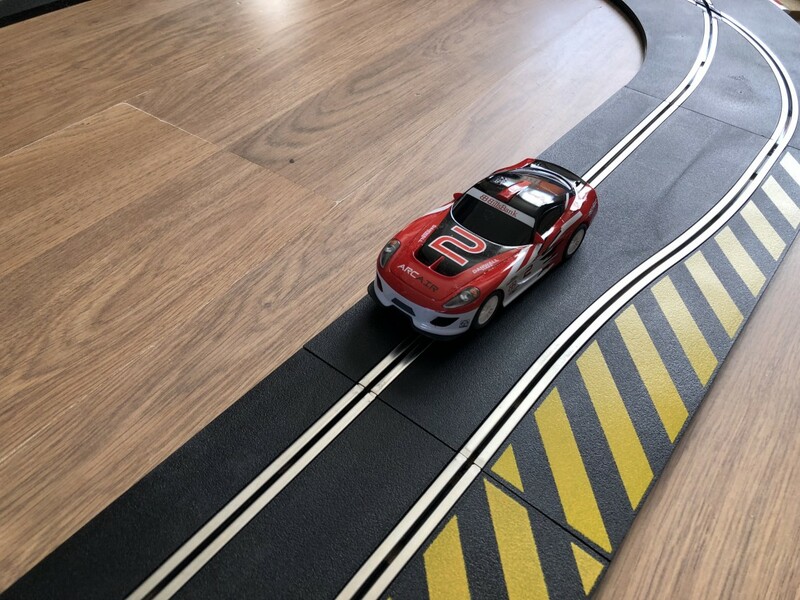 We have been trying out the Scalextric Endurance Set, the Track Extension Pack 1 and the Ultimate Track Extension Pack. We couldn’t wait to build the set and get stuck into the race. 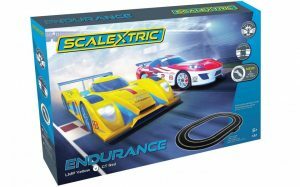 Inside the Scalextric Endurance Set is everything you need to get started. 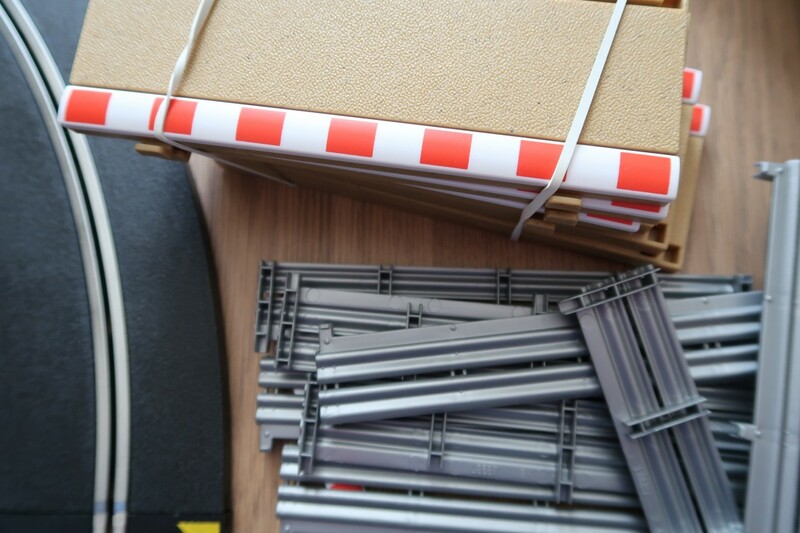 There is plenty of track, corners and the starting section, two cars, cables and spares for the cars. The instructions show you how to set a track, how to join it together and away you go. The track clicks together. It is much better and more sturdy than days gone past. The kids clicked most of it together and I helped with any bits that were a little stiff. Underneath, you can see that the tracks stay together well. To dismantle the track, you need to click down on the arrows above to release the track and it will separate with ease. I think this is a great new idea, making it simple for kids to use and it means that the metal tracks don’t separate for connectivity disruption. 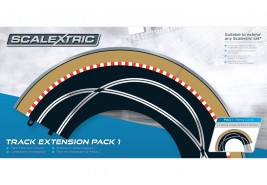 The Scalextric Endurance Set comes with a basic circular track that totals 22cm. 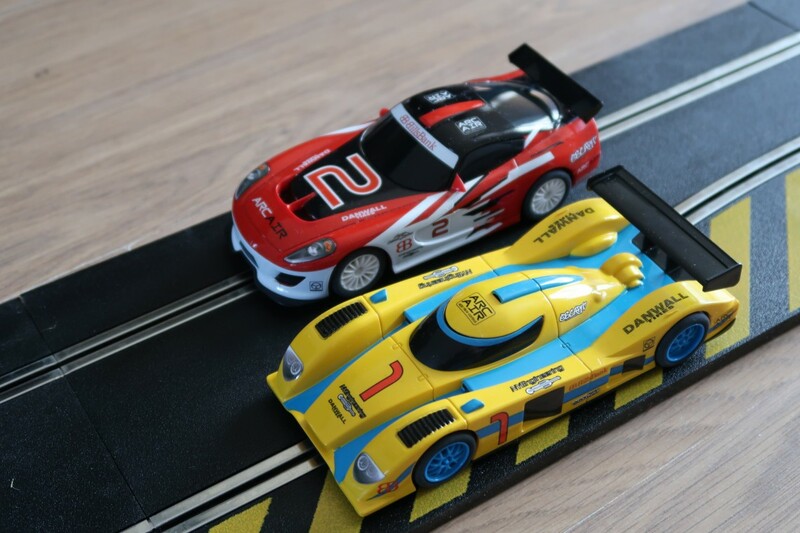 The two cars are supplied come with two-speed limiter controllers, allowing younger kids to use how fast the cars can go, so they don’t keep flying off the track. 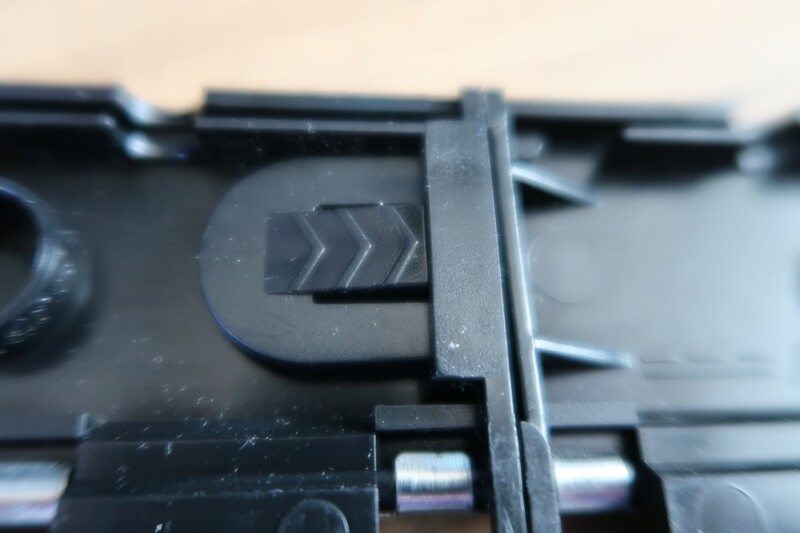 The cars have the metal sections underneath which connect with the metal on the track to make it go. 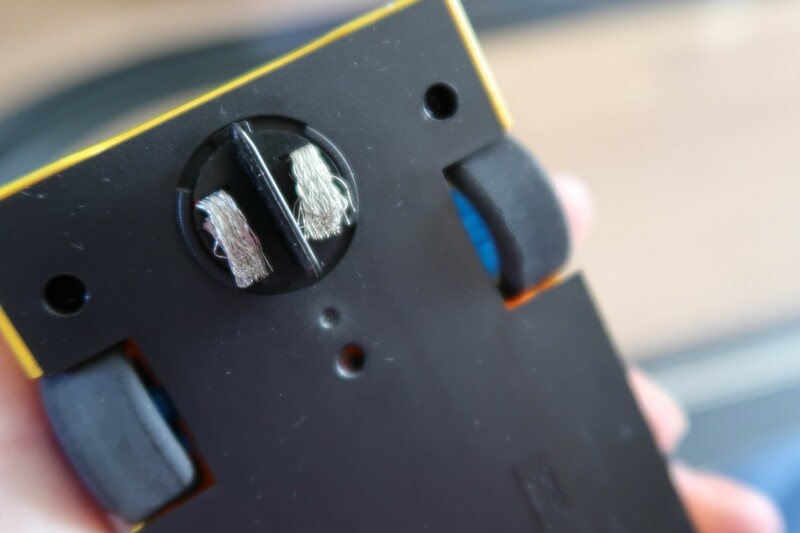 These parts are removable to allow them to be replaced due to wear and tear. The set comes with spares and it shows you how to remove them. It is simple, even I did it. 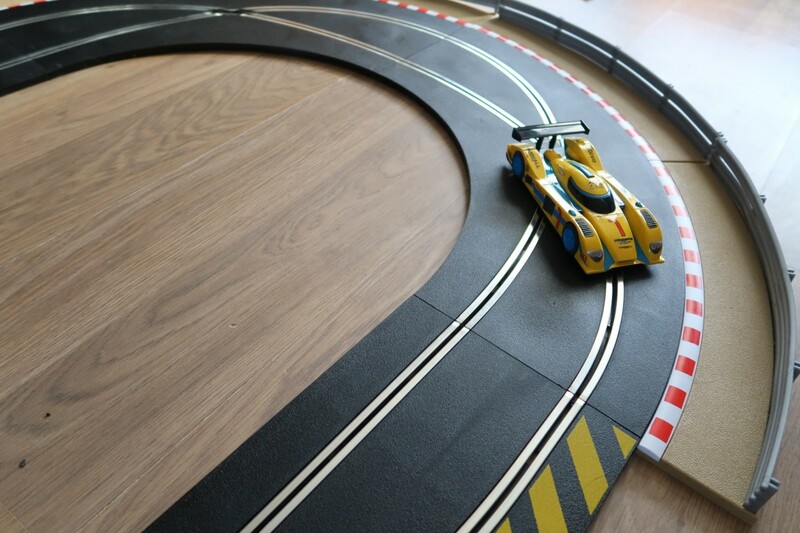 The Scalextric Set Extension Pack 1 contains two racing curves, borders and barriers, which are hugely helpful. 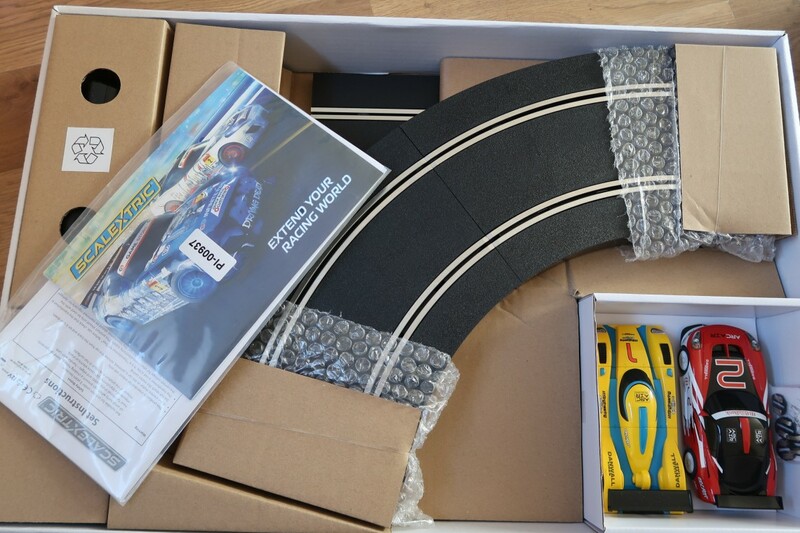 The Scalextric Ultimate Extension Pack has a Leap ramp, two straight track pieces, two hairpin curves, two-quarter straight track, four sideswipes and some borders and barriers. The borders and barriers make a huge difference when keeping those cars on the track. The corner packs hook underneath the track easily, you don’t have to add the barriers on, but once you start racing the cars, depending on the speed they do help stop the cars flying. We set up a relatively basic track with the transformer as the start. You need to make sure you can plug it in. The controllers then plug into that. We went with a few bits from the expansion packs to mix things up and then added to the barriers. It was simple to do and built within 20 minutes. It isn’t at all flimsy, looks and feels great. As soon as it was built, Aria and Tyler couldn’t wait to race. 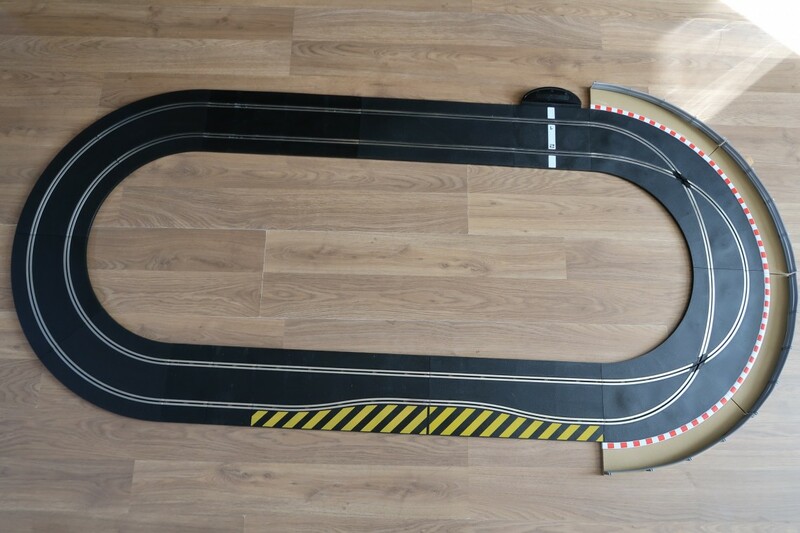 The controller’s plugin and the cars slot easily into the track. There is a switch on the controller that moves allowing free reign of speed up to controlled and everything in between. I think this is a great feature. Kids are tempted to press down full throttle and off it flies from the track. The kids counted how many times around the track they could go and the first one to three wins. The cars look great, don’t they? Proper formula one racing cars. There are others you can buy to go onto the track, but we love these ones. They are bright, colourful and there are no stickers to put on. You know, as a parent that sometimes drives me nuts unless I can do it myself. 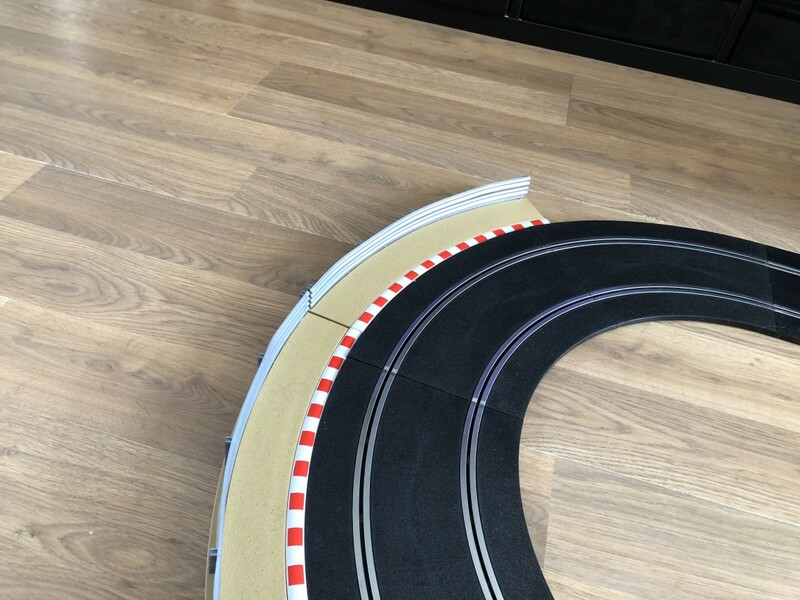 You can see here why they borders and barriers make good use with the track changeover pieces, the cars can crash into each other which adds to the fun. It means the cars can go faster round the bend and I think they look more like a real race track too. When your sister wins. 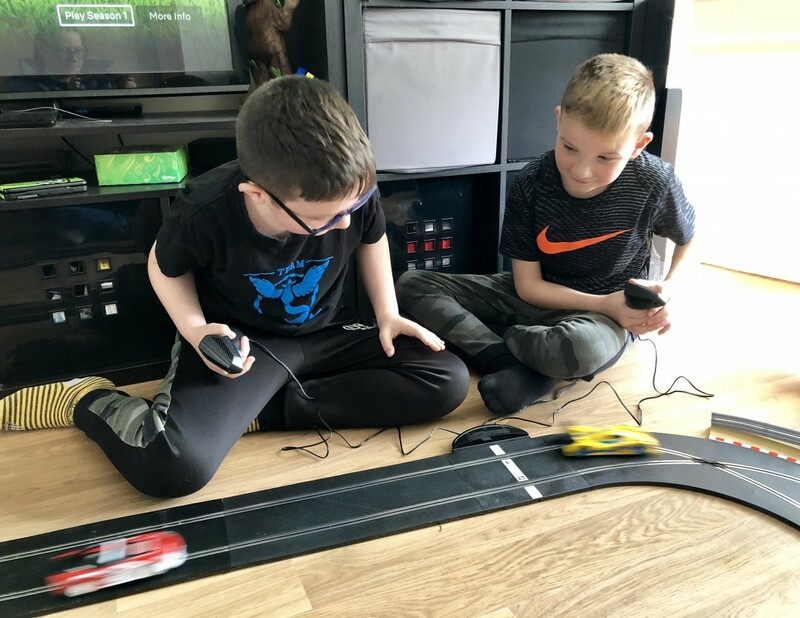 They made up all sorts of games, see who could go round the fastest, how many laps can you do before coming off and who can get the car off the track first. There is so much fun. 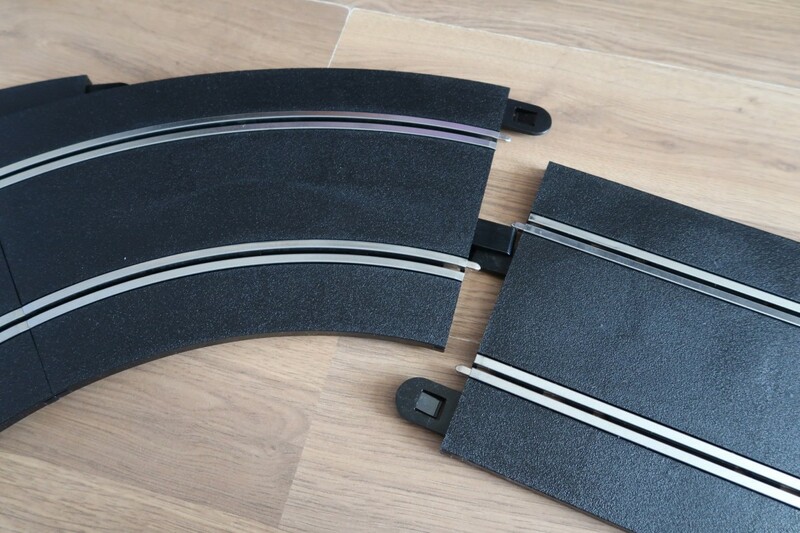 Plus, loads of different track styles too. A figure of 8 is next on our list. It really is a great toy that appeals to all ages. My oldest is at high school now and too cool to play with toys, but not this. As you can see he loved it. The cars go really fast and it wasn’t the easiest to capture. I love that it can be simply put away for next time. The boxes make great storage for them too. 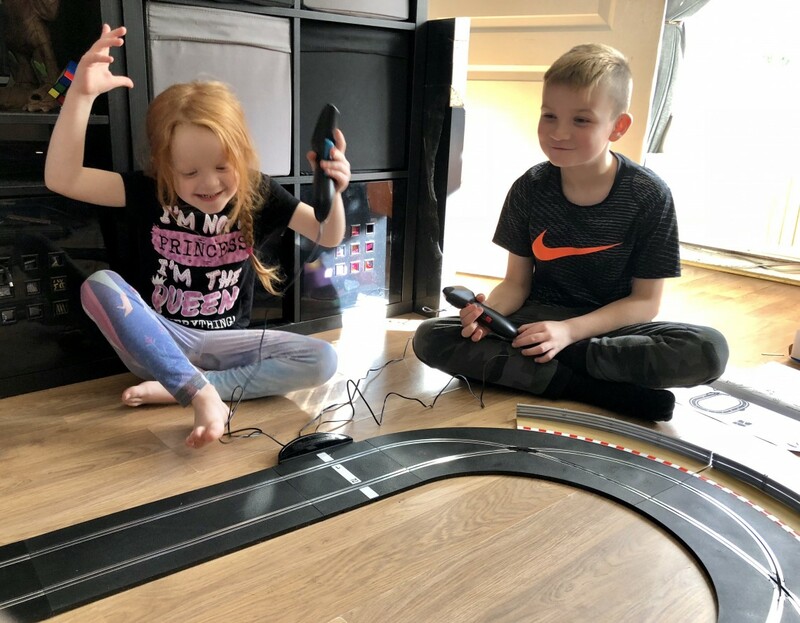 I love that Scalextric appeals to all different ages of kids, which is great when you have three different ones like me. It is suitable from ages 5 upwards. Even adults love it. If they are anything like my husband, he is very competitive and wants to beat the kids at the game. 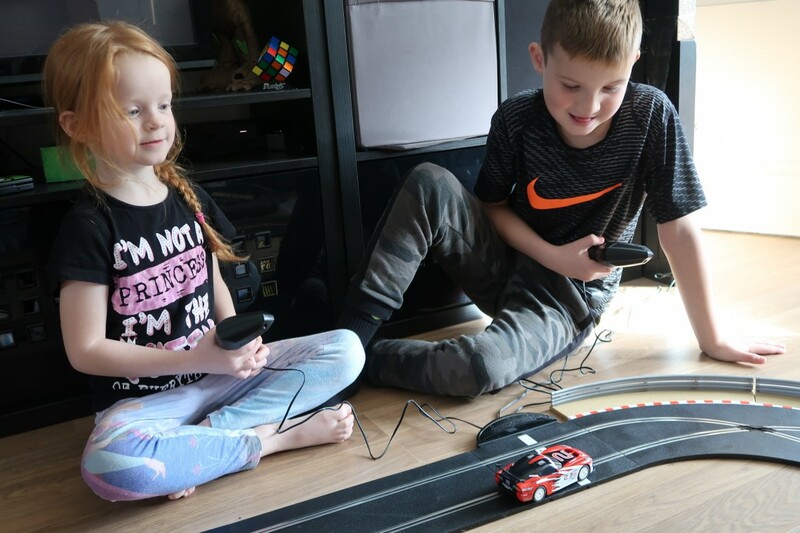 Scalextric is a timeless toy, one that will never date and come out in years to come. Not only that, you can add to it year after year. Make it as personalised as you want. It does take up space at the time, but it can be put away within a few minutes. It’s a toy that gets families together, cheering each other one and it gets them away from screen time. It is fun and it would make a wonderful family Christmas gift this year, for the whole year round. 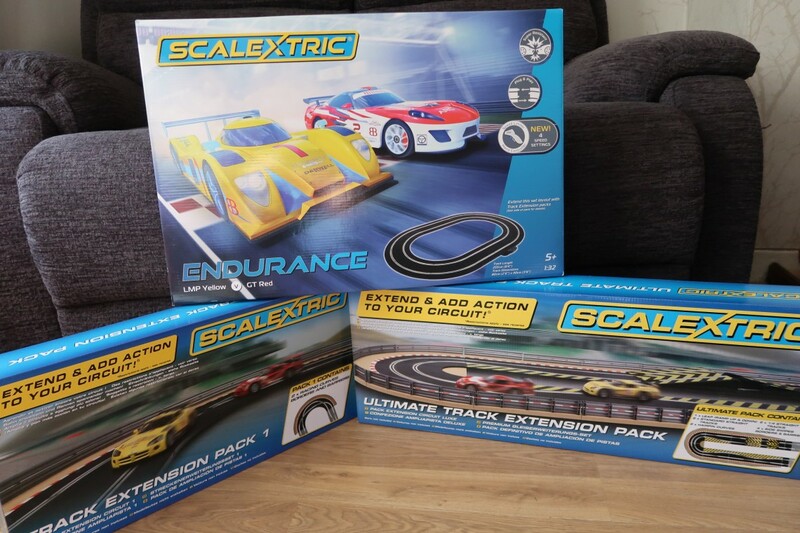 Disclaimer:- We were sent the Scalextric Endurance Set along with the Track Extension packs for the purpose of this review, but all thoughts and opinions are my own. I would like to race a red car. Yellow seems a pretty cool colour to me. The yellow car appeals to me . The red one for me please. we’d love to race with the red! red as hot & fast as fire! Would like to race a red car! The Yellow as it’s supposed to be my lucky colour in chinese astrology. Red, because I know that my son would pick yellow. It just has to be red! The Red one as i always associate it with ferrari`s. I’d have to be Yellow as i’m colour blind it stands out more to me. Especially if they fly of the track and vanish under a sofa. It’s has to be red of course! Red is the best! The red one is my favourite! I’d like the yellow car! Yellow would be my choice! I’d love to race the red car. I would race the yellow car. Yellow because my 3 year old grand daughter said pick Yellow nan this is a fab giveaway thanks for the chance fingers crossed. id gift it to my nephew and then id be the coolest aunt ever and you cant go wrong with the title of coolest aunt ever. Blue for me! But I would let my sons use the new Red and the Yellow ones! I would definitley want to race the red one against my fiance. I’m sure the kids would take over after that. Thank you for the chance to win. l would choose my favourite colour which is red!